Marvel Presents #9 was cover dated February 1977 and came out November 1976, just like me. It shared the spinner racks with Action Comics # 468, Avengers #156, Flash #247, Iron Man 95, Justice League of America #139 and What If? #1. 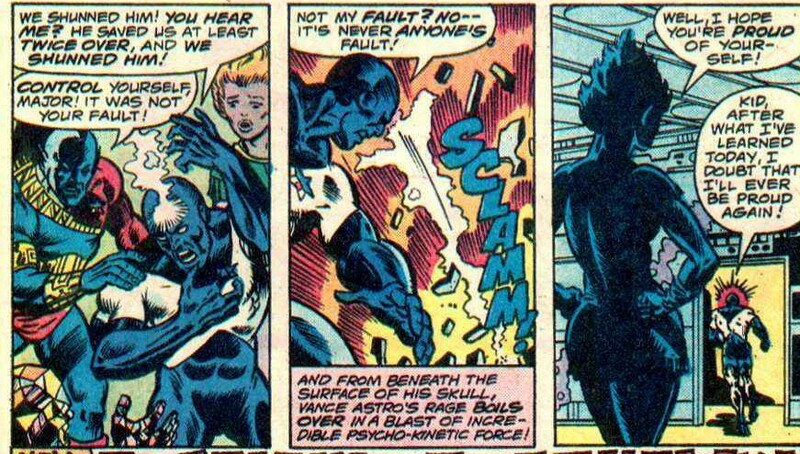 Breaking Up is Death to Do was written by Steve Gerber and drawn by Al Milgrom and opens with Vance Astro throwing another tantrum. 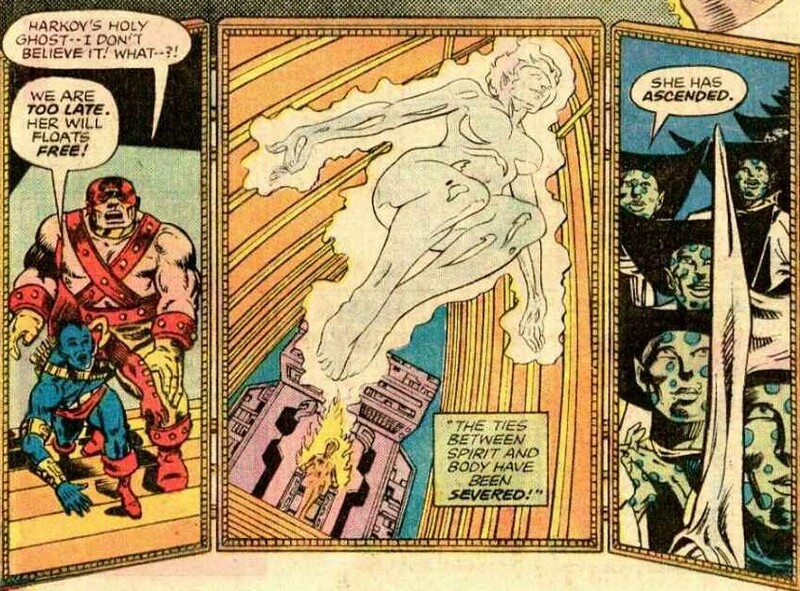 This tantrum relates to Marvel Presents #7 when Vance and Nikki shared an intimate moment, it doesn’t relate to the tantrum in Marvel Presents #8. Vance in his anger accidentally strikes Nikki with his psychokinesis and when he checks to see if he has hurt her, she kisses him and he over reacts, but before they can argue further, they are summoned to the bridge as they are under attack. The ship is enclosed in a force field which is dowsing the Captain America and all on board with increasing levels of lethal radiation. 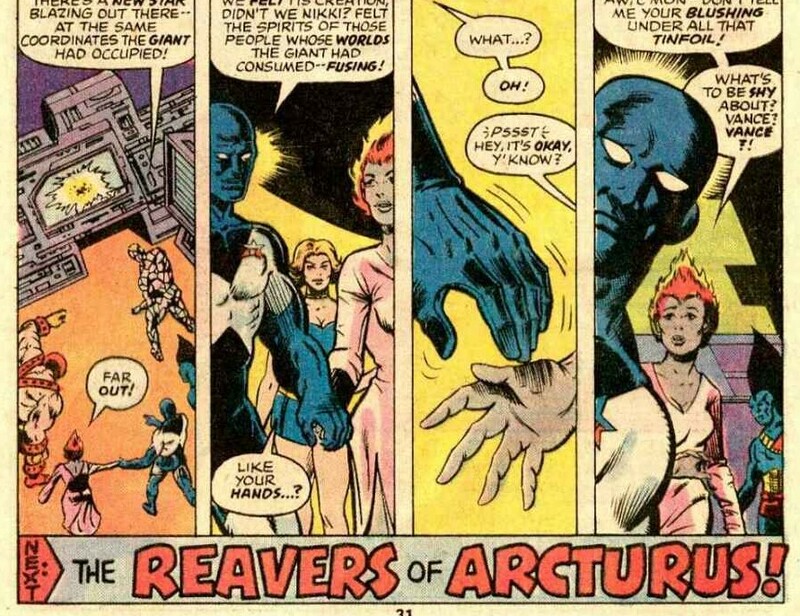 Aleta announces that this attack is the opening move of a race called the Reavers of Arcturus. 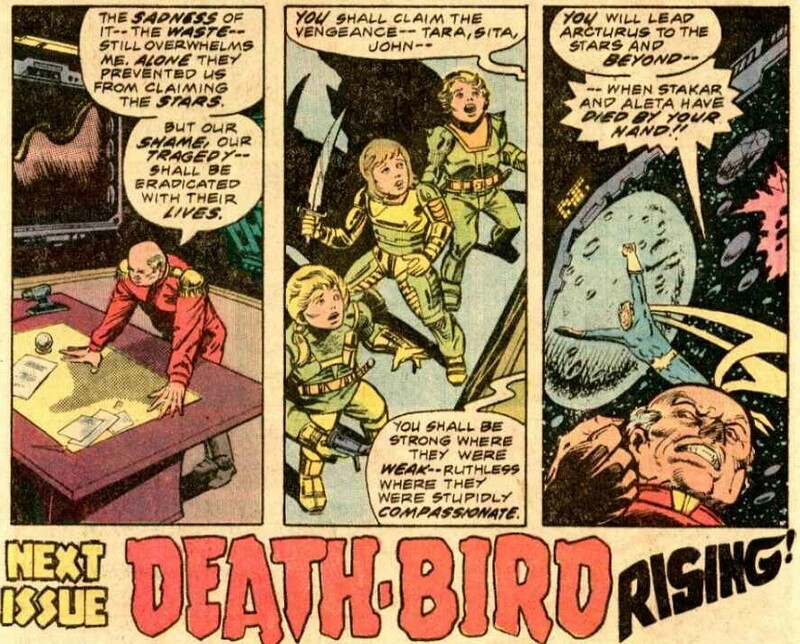 Before any more questions can be asked, her form is replaced with that of Starhawk. Starhawk mentions having faced the Arcturans before and is on his way to face them again, when he collapses in pain and then he seems to split into both Aleta and Starhawk, who both collapse. This is the first time that the others had seen them together, but not as it transpires, the first time from their point of view. Yondu brings them to sick pay and uses some sort of mystical trance to get the origin of the two of them. 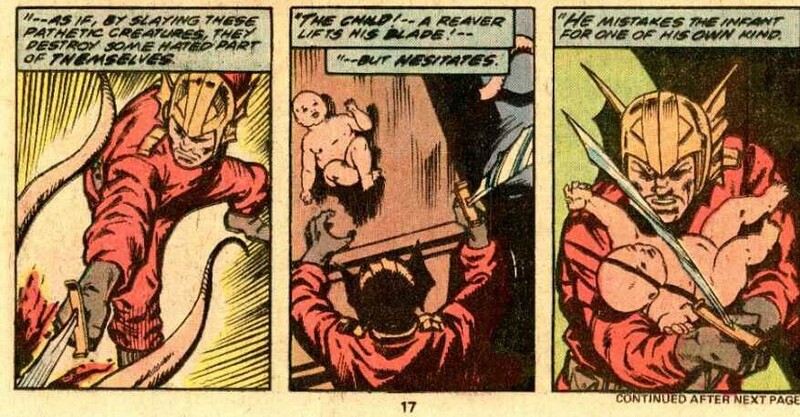 A baby is found by a mutated creature on an un named world during an attack by the Reavers of Arcturus. 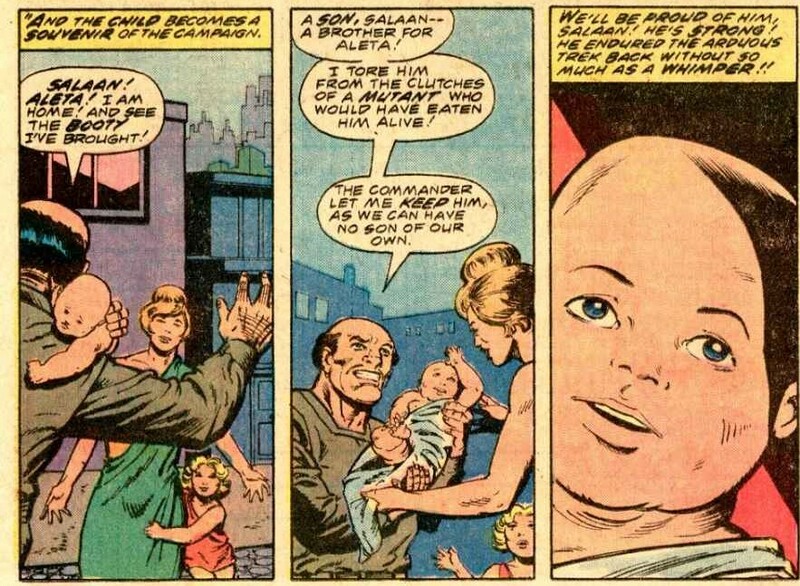 One of the Reavers called Ogord, finds this baby and returns it to his world to raise as his son along with his daughter Aleta. The baby becomes a young man called Stakar who along with his sort of sister Aleta investigate the ruins outside the capital. They find the temple of the Hawk God and that’s where this flashback ends. 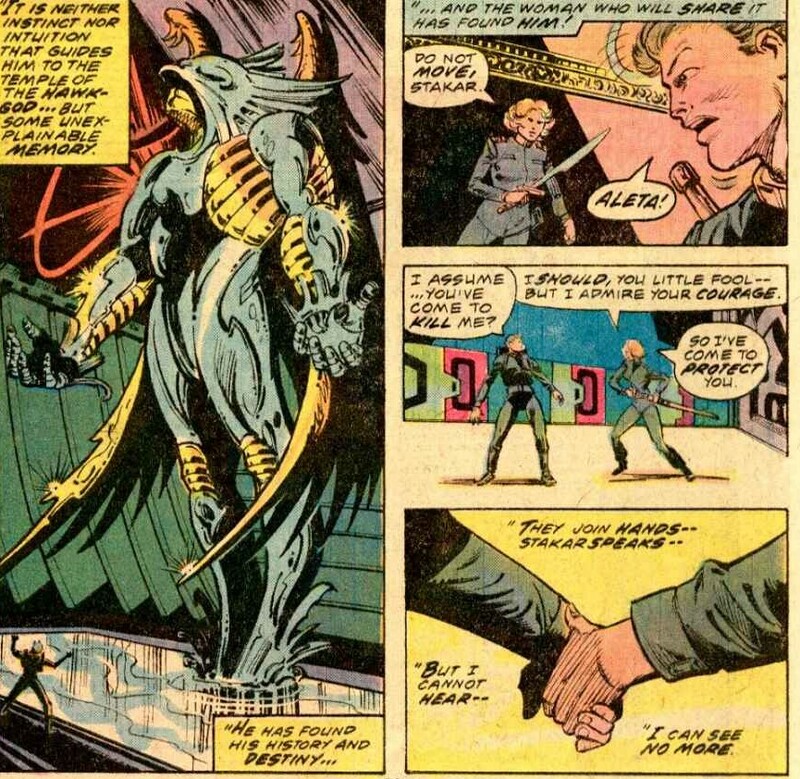 As the unconscious pair hold hands, the Arcturans board the Captain America ready for war whilst far away Ogord, Aleta’s father waits with Tara, Sita and John and plots his revenge. Notes: Whilst rushed it’s a quality issue, ignoring the previous issue’s events it rushes back into the story of Starhawk & Aleta and some great space opera action. Marvel Presents #8 was cover dated December 1976 and was on sale in September 1976, sharing the spinner racks with Action Comics #466, Fantastic Four #177, Green Lantern #92, The Man called Nova #4, Rag Man #3 and Peter Parker the Spectacular Spider-Man 1. The Story was written by Roger Stern and pencilled by Al Milgrom and opens with Martinex and Charlie-27 doing some EVA to collect a Badoon device from outside the Captain America. They bring it aboard and discover it to b e a mento-recorder which recorded the first attempt by the Badoon to conquer Earth in the 1970’s. The team being curious gather to watch it. 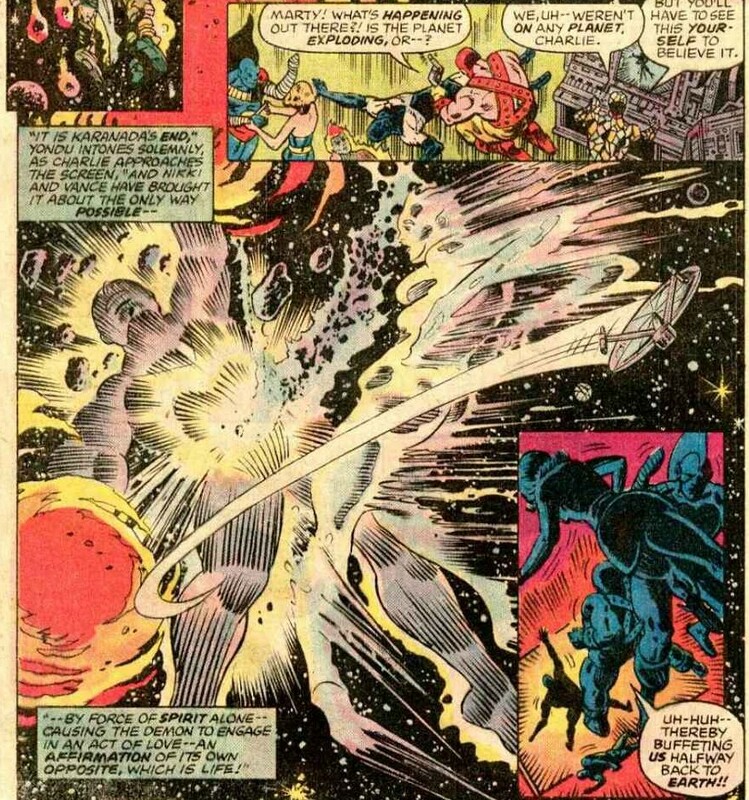 The recording is actually a reprint of Silver Surfer #2 written and drawn by Stan Lee and John Buscema. In this tale, the surfer Is flying around the world and discovers a spaceship hidden from detection. 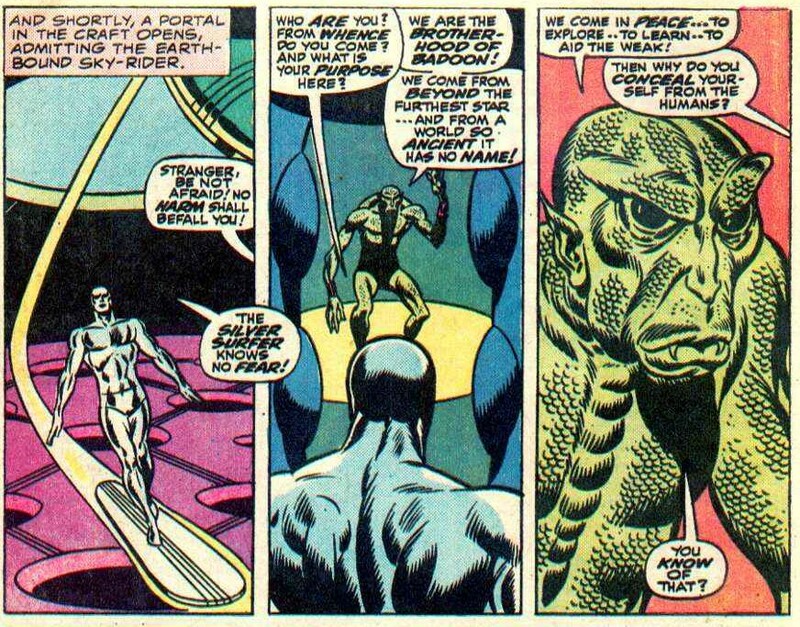 He approaches and boards the ship and is greeted by an alien race calling themselves the Badoon. 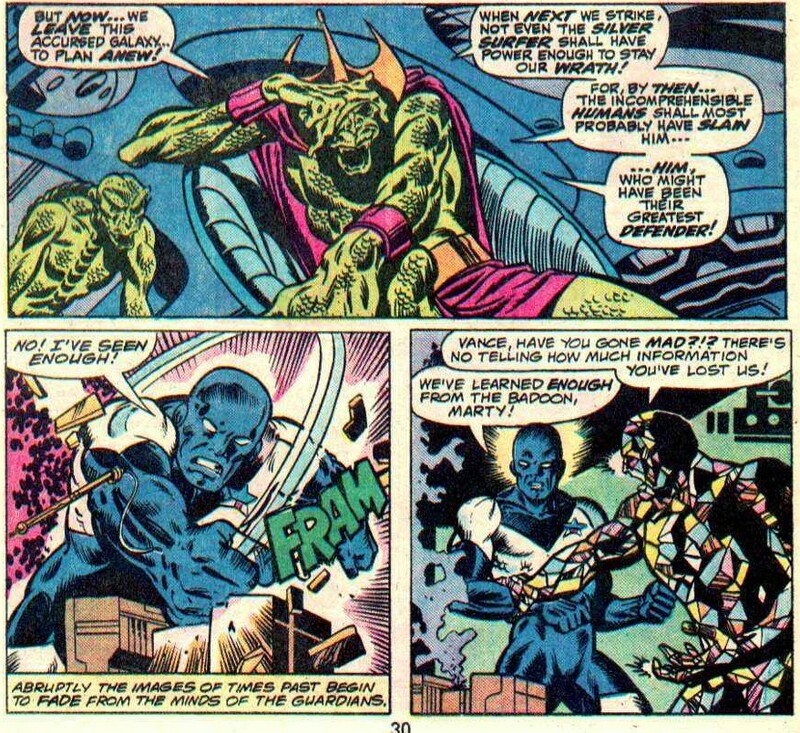 The Badoon claim to be benevolent and describe a plan to elevate humanity, but the timely escape of a woman held prisoner cause the surfer to attack the Badoon. 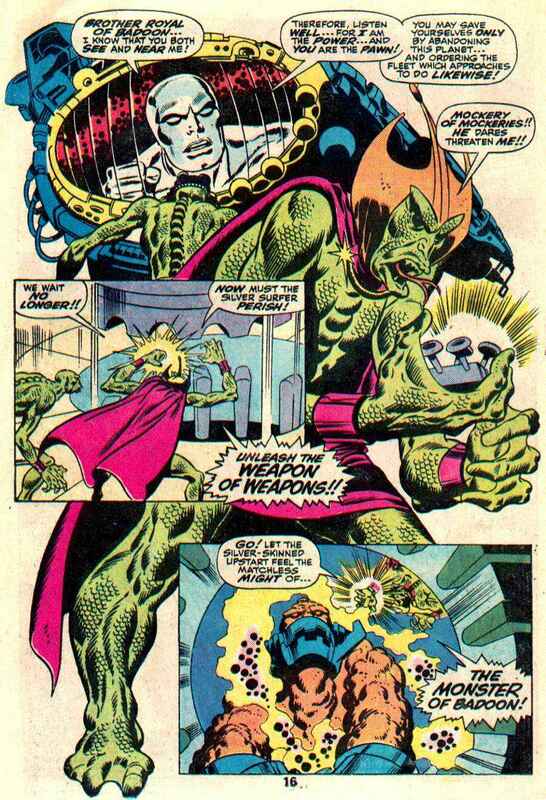 In order to meet this threat the Badoon unleash the Monster of the Badoon. 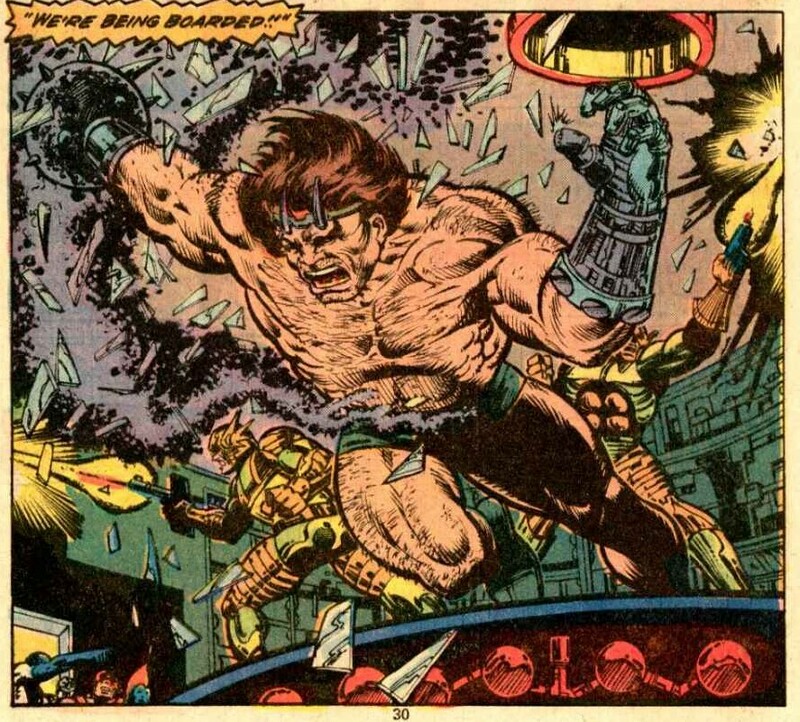 The surfer battles the monster, but as only he can see the Badoon it appears he is blasting randomly, attacking the city below. 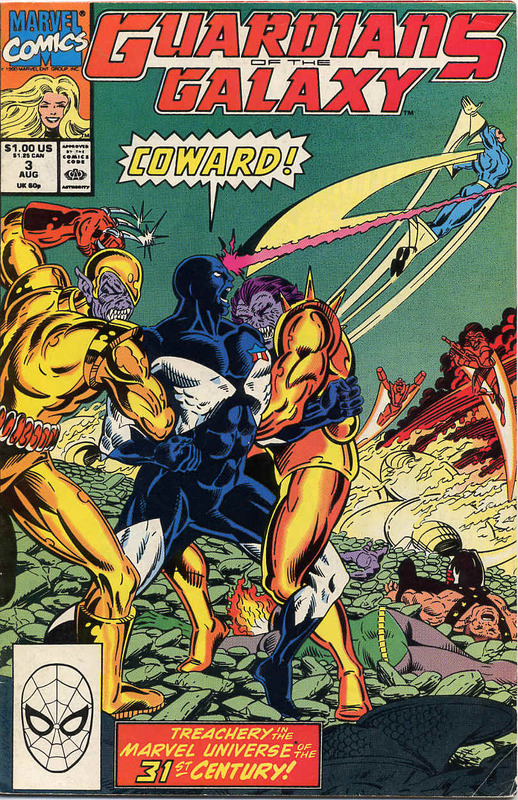 The army is called and the surfer is fire upon, this catches the Badoon in the crossfire. The Badoon fearing they are discovered depart, but they vow to return. After seeing all this, Vance loses his temper and storms off, decrying the short sightedness of the planet and time he came from. Notes: This is a reprint from a silver age story and is used as a fill-in story, if you haven’t read it, it’s a lovely treat, if you have it’s a clear reprint fill-in. As a Guardians story it falls flat, but as a Silver Surfer story it’s great, full of the wonder that made the silver age shine. 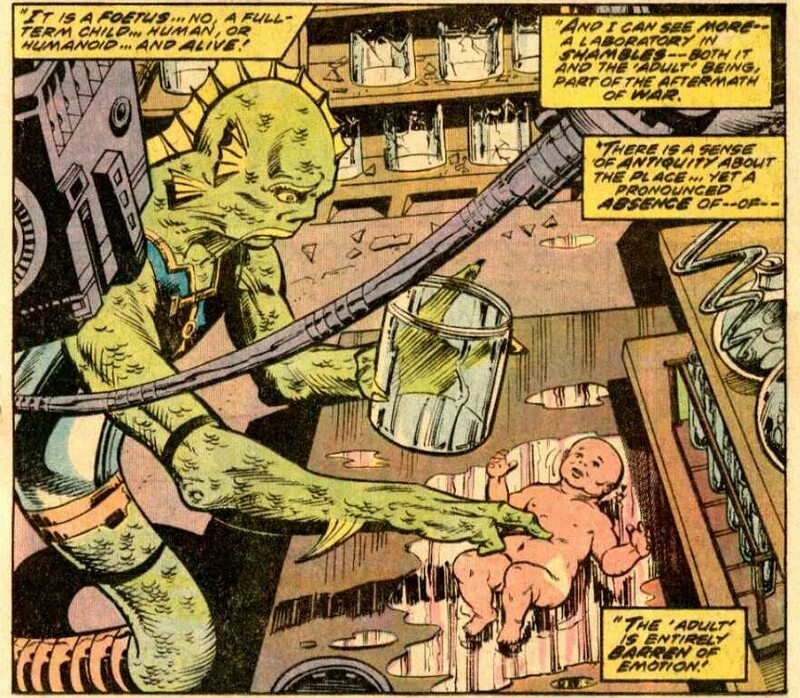 The Badoon showing patience shows this older story tying into the Guardian’s history and acts as a subtle retcon. Marvel Presents 7 was cover dated November 1976 and went on sale in July 1976, sharing the spinner tracks with Action Comics# 484, Avengers #152, Green Lantern # 91, Iron Man #91 Isis# 1 and The Man called Nova #2. 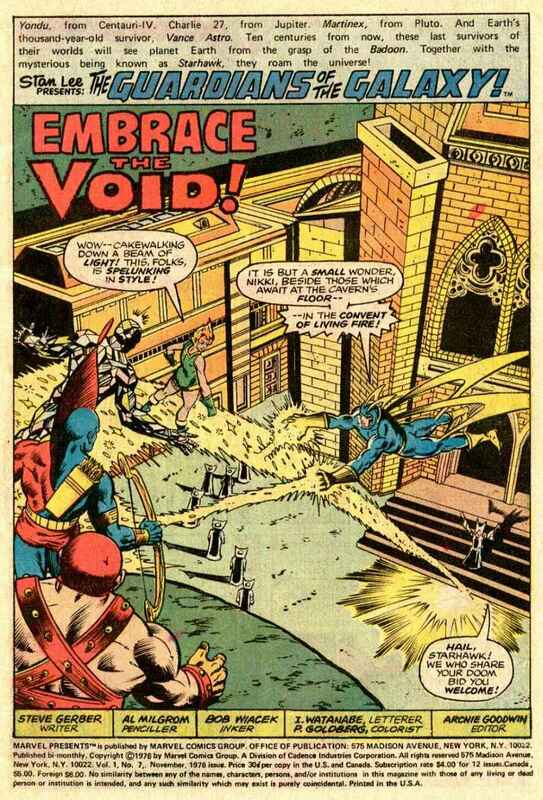 Embrace the Void was written by Steve Gerber and Al Migrom and Bob Wiacek were the art team. 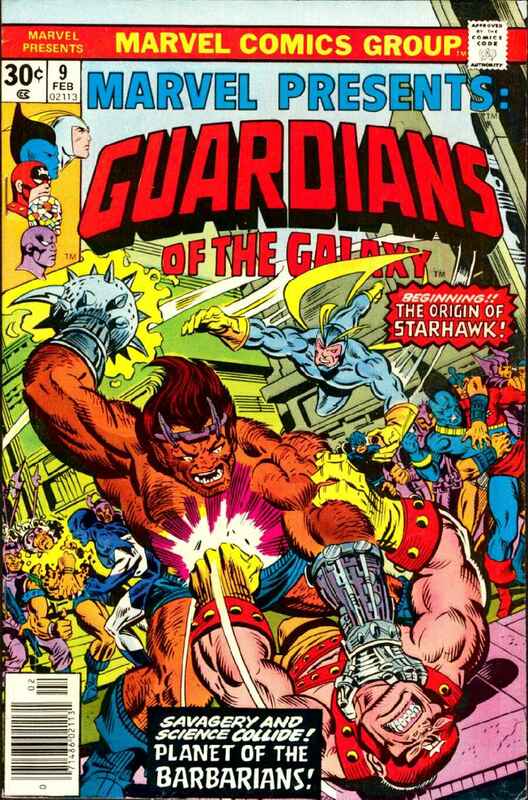 The story opens with Star Hawk leading the Guardians to a convent seen in the last issue, where another reptile race are praying. The odd thing here is that their form of prayer is accessing a latent part of the brain and burning themselves. 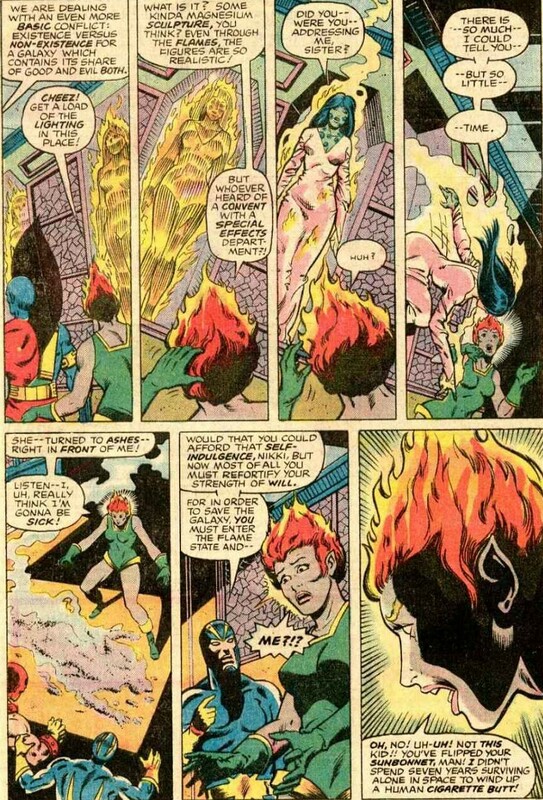 Starhawk informs Nikki that to stop Karanada and save the galaxy she needs to enter this flame state. To be honest, she’s less than thrilled. 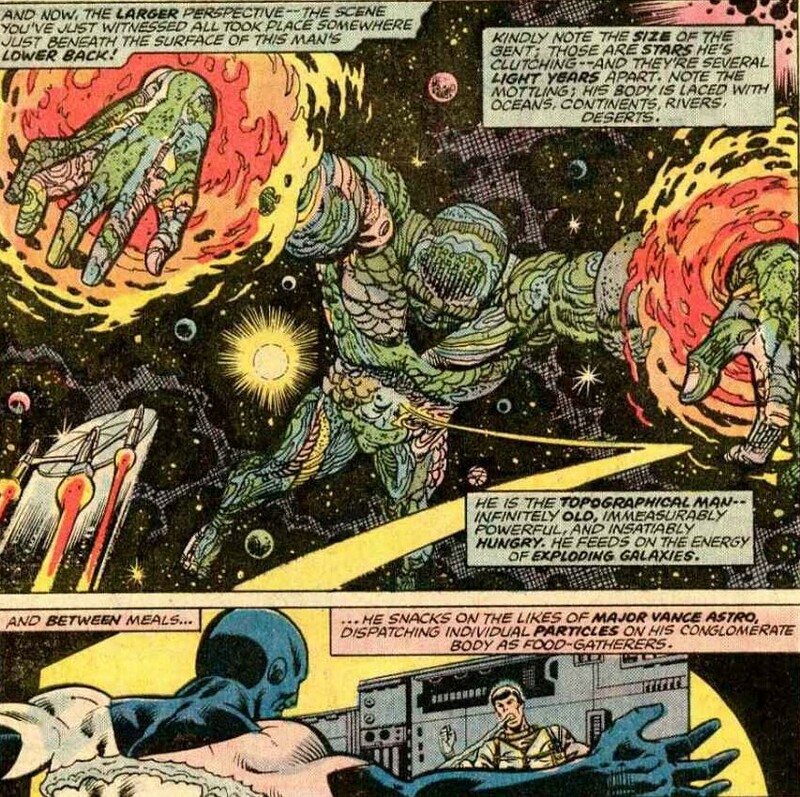 Back of the Captain America, Vance Astro faces off against a piece of the Topographical Man shaped to look like himself when he was younger and the two face off in a battle for Vance’s life force. Vance wins, but wakes in the other him and not his foil suited self. 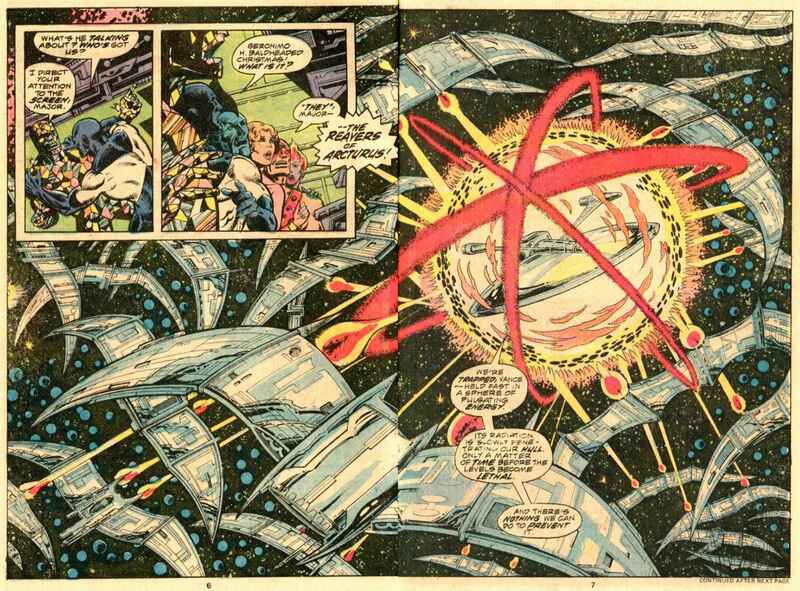 There is then a cut away to a deserted space station, with a building and some farm land inside, this is the same place where Starhawk visited his three children. The station is a shambles, having clearly been attacked. Aleta, the woman sharing Starhawk’s body can only weep from her computer screen before it too succumbs. Nikki is being prepared to attaining her flame state when Starhawk runs out of the room, in pain and demands no one follow him. Martinex decides to follow him. As Nikki starts to become flame, Martinex catches up to Starhawk, who immediately changes into Aleta, who informs Martinex that the body is her’s and that the Reavers of Arcturus have murdered her children who were abandoned by Starhawk. 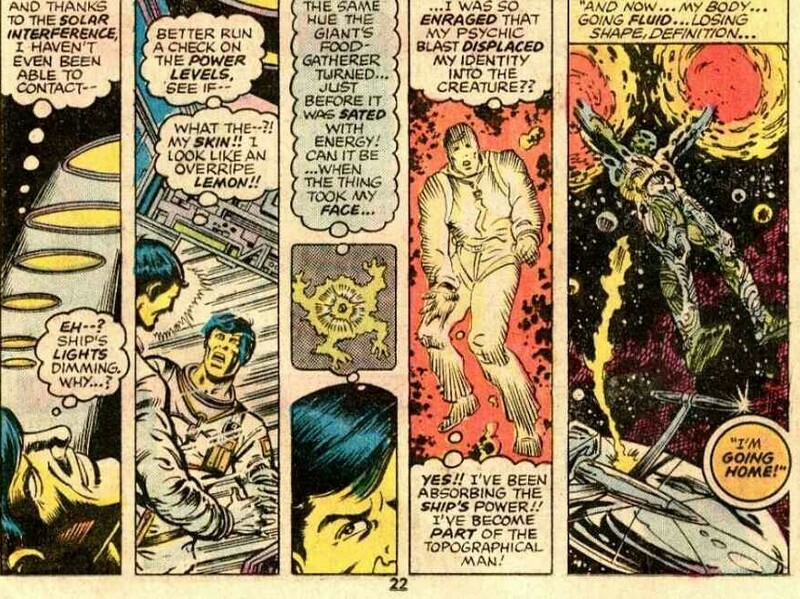 On the ship Vance begins to absorb the ship’s energy and is then recalled back to the Topographical Man’s body, whilst Nikki achieves the flame state and her spirit leaves her body and ascends into space. Vance awakes inside the body of the Topographical Man and Nikki’s spirit meets up with him and they embrace, the surface of his body, things are becoming unstable. 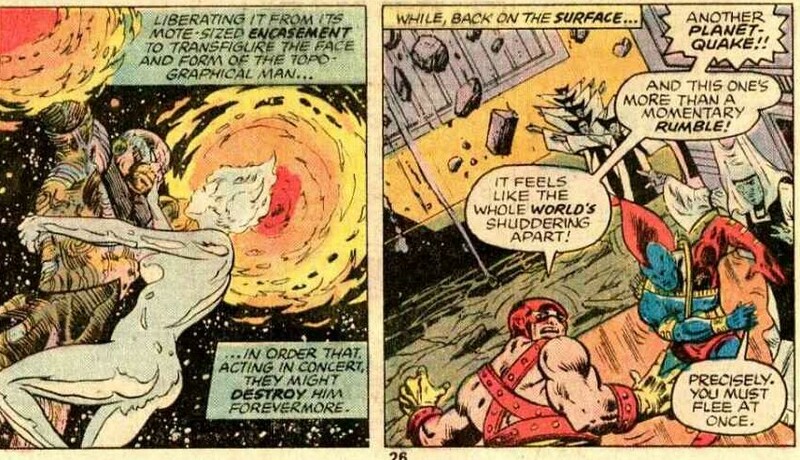 The two embrace as the Guardians return to the ship, to discover the shape of Karanada as the Topographical Man, just before he is destroyed in act of love ending the threat of Karanada once and for all. In the aftermath, a new star is born and Nikki and Vance awaken in their own bodies, changed by the experience, with Vance being particularly affected. Going to have to delay the next post, I have a weekend away planned with my wife and little boy. 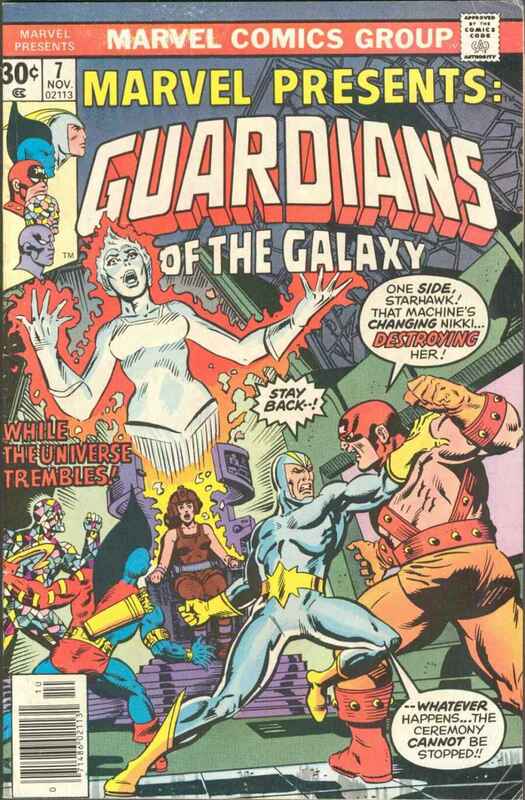 In the meantime, here’s the covers of first two comics featuring the Guardians I ever bought.